in this 2nd (or maybe 3rd pass at this point, i have one thing to say and don’t hate me for my social speak #LOVEIT!. i’ve decided that since Allegiant is due out in 1 week’s time, i owed it to myself to re-read the first books so that i’m fully up to speed on who’s alive, who we like, who we hate etc. Well, whatever i thought of Divergent before, i love it more now. We are taken on a ‘soul finding’ journey in a sense where Tris, our leading female is 16 – coming of age and has to make the decision of whether she’s going to take the safe path as stay in her family’s faction – Abegnation and live a boring yet safe life, or if she’s going to take a risk, and change EVERYTHING that she knows and transfer. It’s not surprising the Tris has decided to transfer to Dauntless no less, and well, we see that she hits her stride during initiation. she finds that she’s much stronger than she thought, and she breaks out of her shell quickly. Along her journey, she makes actual friends in her fellow initiates, Christina, Uriah, and a few others. She also begins to feel an attraction to someone else, when she gets a sense from Four (Tobias) that there’s maybe more to the trainer / trainee relationship. What i love here is that not only do we get the complex story of a teen having to choose her life’s path, but we get to see that evolve, and then we get to see the greater picture of what’s happening in society and who’s pulling the strings. Where this first installment leaves us off is a GREAT bit of a cliffhanger. We see that there are evil intentions all around, and that Dauntless is a pawn in this. We see that folks that are supposed to be the good guys really are the puppeteers, and that’s going to play out nicely i’m guessing in the final installments. Good news is that i have Insurgent already so i can dive into it tonight, bad news is that i’m sure i’ll finish it before Monday night so that will leave me feeling a bit empty until 10/22/13 comes around. 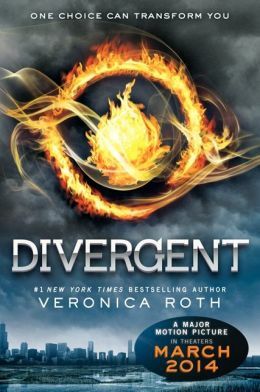 This entry was posted in Dystopian, Reviews and tagged divergent, Dystopian, Veronica Roth, YA by iscm13. Bookmark the permalink.